Graduate training in the John Adams Institute consists of both a series of lectures and a design project. The lectures cover the basics of accelerator physics, from lattice design to RF and laser plasma acceleration. During the second term students complete a team design study of a real accelerator to consolidate their learning and to give them a supervised experience of how an accelerator design project evolves. Students split into teams, each focusing on different element of the design. 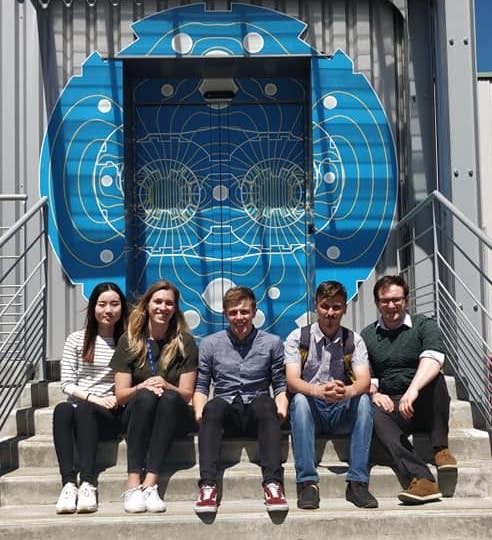 In 2018 students prepared a design for the Higher-Energy Large Hadron Collider (HE-LHC), which is part of the Future Circular Collider (FCC) study. At the end of the study they presented this work to the JAI advisory board and in a seminar given at CERN. The graduate lectures are given by Prof. Emmanuel Tsesmelis, Dr Suzie Sheehy, Prof. Riccardo Bartolini and guest lecturers form CERN and Cockcroft Institute. The graduate lecture courses now include plasma lectures provided by Imperial College colleagues, as part of development of the integrated accelerator-laser-plasma training.